^ Giovinazzi gets Ferrari simulator run. 2016-09-05 [2016-09-05]. ^ Giovinazzi joins Ferrari F1 team as third driver. 2016-12-19 [2016-12-19]. ^ Wehrlein suffers scary Race of Champions crash as Vettel wins again. [2017-01-23]. ^ Pascal Wehrlein not to start at the Australian Grand Prix. [2017-03-25]. 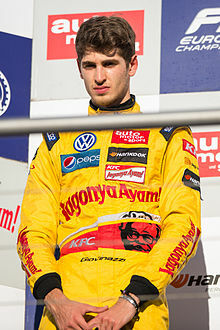 ^ Antonio Giovinazzi to race for the Alfa Romeo Sauber F1 Team. [2018-09-25].